Carvoeiro is a wonderful village built around a small fishing harbour. It is a sought-after holiday destination with beautiful residential areas and a luxury resort, built on a cliff 30 m. above sea level. The luxury villa rentals of Residence Royale are located on unique locations. Look at our villa selection in Carvoeiro and book now. Holiday villa Bonny is for rent in a beautiful resort, only 1,5 km. from the nearest beach. The resort lies approx. 5 min. from Carvoeiro centre with lots of restaurants, bars and shops. Lovely holiday villa with 3 bedrooms, 3 bathrooms, heated pool, air conditioning, WiFi internet and distant sea view! Villa Atlantico Cliff 1 is for rent in a beautiful resort right on the Atlantic Ocean and only a 5 min. walk from the beach. Lovely holiday villa for 8 with heated pool, air conditioning, WiFi internet and absolutely breathtaking sea views! Holiday home Atlantico Cliff 10 is for rent in a beautiful resort in Carvoeiro (Algarve). This wonderful holiday home is situated on top of a cliff right above the Atlantic Ocean with stunning sea views. This spacious holiday home with heated pool accommodates 10 persons. 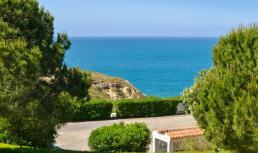 Villa Marilotte is for rent in Carvoeiro (Portugal) in a protected resort right on the Atlantic Ocean and only a 5 min. walk from the beach. Lovely modern holiday villa for 10 with 5 bedrooms, 5 bathrooms, heated pool, air conditioning, WiFi internet and breathtaking sea view! Villa Atlantico Club 3 is for rent in a beautiful resort, only 2 km. from the beach. The resort lies approx. a 5 min. drive from Carvoeiro with lots of restaurants, bars and shops. Stylish holiday villa for 8 with heated pool, air conditioning, WiFi internet and distant sea view! 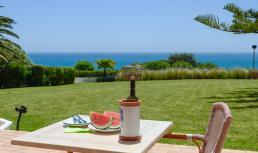 Villa Mariaco is for rent in Carvoeiro (Portugal)within walking distance to the village centre and the beach. Amazing holiday villa for 10 with 5 bedrooms, 4 bathrooms, heated pool with paddling pool, air conditioning, WiFi internet, szea view and private tennis court! Villa Atlantico Club 5 is for rent in a beautiful resort, only 2 km. from the nearest beach. The resort lies approx. a 5 min. drive from Carvoeiro with lots of restaurants, bars and shops. Lovely holiday villa for 6 with heated pool, air conditioning, WiFi internet and sea view! Vacation villa Butterfly is for rent in a quiet residential area in Carvoeiro (Algarve), close to the Atlantic. This spacious villa has 7 bedrooms and 6 bathrooms sleeping up to 15 persons. An superb vacation villa for large families! Holiday home Casa Alria is for rent in a quiet residential area in Carvoeiro only 1 km. from the Atlantic Ocean. This spacious holiday home with heated pool can accommodate up to 16 persons. The beach is only a 15 min. walk away.